Greetings again from the darkness. For those skeptics who scoff when filmmaking is described as an art form and labor of love, co-directors Dorota Kobiela and Hugh Welchman invite you to take in their nearly decade-in-the-making project. It’s the first fully hand-painted on canvas feature film – experimental filmmaking crafted by more than 100 artists and including an estimated 130 paintings, with 65,000 individual shots/frames. 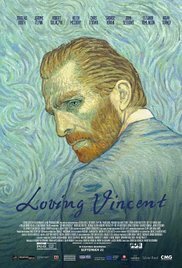 The spectacular visuals were created by painting over the images … both of actors performing scenes and van Gogh’s paintings. By adding to and amending images, even 10 times or more, the scenes come to life with movement and a pulsating psychedelic feel. The familiar colors of his paintings create a level of connection, while black & white images are used for flashbacks and reenactments. Though we have never seen this look on screen before (this goes beyond Linklater’s WAKING LIFE), the stunning visuals are accompanied by what can be described as a detective story or murder/suicide mystery. It picks up in 1891, one year after van Gogh’s suspicious death. A local Arles postman holds one last letter from Vincent to his beloved brother Theo. Having held onto it for much too long, he asks his son Armand Roulin to hand-deliver the letter to Theo. Sporting the yellow blazer so recognizable from his portrait, the angry and skeptical Armand heads to Paris. Little does he know, this is only the beginning of his journey … a journey that finds him researching Vincent’s life and a journey that helps him discover more about himself. There have been many movies made focusing on this amazing artist: LUST FOR LIFE (1956), VINCENT (1987), VINCENT & THEO (1990), and VAN GOGH (1991). This one is filled with contrasting and conflicting stories, theories and recollections, and descriptions of events from those who crossed paths with the artist on a daily basis. We listen right along with Armand as he spends time in Avers-sur-Oise … where Vincent lived, painted, and died. Many of the actors involved are recognizable even in this artistic format: Chris O’Dowd is the postman, Douglas Booth is Armand, John Sessions plays art supplier Pete Tanguy, Eleanor Thompson is the innkeeper’s daughter Adaline, Jerome Flynn is the controversial Dr. Gachet, Saoirse Ronan is Gachet’s daughter Margarita (recognizable from her piano portrait), Helen McCrory plays the disgruntled Gachet housekeeper, Aidan Turner is the boatman, and Robert Gulaczyk is Vincent. Since these folks were all part of van Gogh’s artwork, we are fascinated to see them come to “life”. Vincent van Gogh picked up a brush for the first time at age 28. He was dead at age 37, and left behind approximately 800 paintings of portraits and landscapes – many among the most famous pieces in the world today. Did he try to commit suicide as he claimed or was there a more sinister explanation for his death? Of course the filmmakers only hint at possible answers and can’t solve a mystery that is approaching two centuries. Understanding the man is challenging, and perhaps our best hope is through the work he left behind. This is a compelling cinematic experience and we have certainly benefitted from the filmmaker’s labor of love. Clint Mansell’s score leans heavily on strings and piano, and is perfect accompaniment for the story. One could question the closing credits use of Lianne La Havas’ version of “Vincent” (renamed “Starry Starry Night”) rather than Don McLean’s, but one mystery per day is plenty. Spot the paintings, play detective, and mostly enjoy the visuals built on the works of a complex, talented, and tragic figure. This entry was posted on Friday, October 13th, 2017 at 10:31 pm and is filed under Animation, Drama, World Cinema/Foreign. You can follow any responses to this entry through the RSS 2.0 feed. You can leave a response, or trackback from your own site.